Latest figures show that online advertising expenditure will eventually overtake TV. This is hot on the heels of the announcement that online ad expenditure will shortly overtake press spend. It would be more accurate to say that online spend (including Search and classified) will shortly overtake national press expenditure excluding national press classified. Whilst the published figures may not reveal 100% of the story, the undeniable fact is that, to quote Rupert Murdoch, 'online is not going away.' These latest, impressive figures show just how quickly it is not going away. The media industry needs to recognise that digital is not something that is 'just done by the people downstairs' (or equivalent). Successful strategies for both media owners and media planners must see digital touching every aspect of what they do - and today's figures should make this more obvious than ever! ONLINE advertising in Britain is expected to overtake the television market by the end of the decade, according to the chief executive of the Internet Advertising Bureau. Guy Phillipson, the IAB’s chief executive, said that by the end of this year the internet advertising market will be worth £2 billion and is expected to overtake national press advertising. National newspapers accounted for 11.4 per cent of total UK advertising spend in the first half of the year. The industry body said yesterday that internet marketing grew by more than 40 per cent in the first half of 2006 to £917 million, compared with the same period a year ago. Online now accounts for more than 10 per cent of advertising spend, up from 7.2 per cent a year ago. A key conclusion from the research is Mr Phillipson’s forecast that the online advertising market will be larger than television in just four years’ time. Internet advertising spend is now half that of the television advertising market, which had a 22.7 per cent market share, down from 23.3 per cent in the first half of 2005. 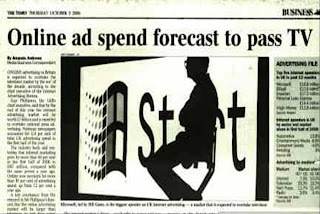 According to the research, which the IAB carried out in partnership with PricewaterhouseCoopers, the consultancy, and the World Advertising Research Centre, online advertising is now worth twice as much as the posters and billboards market, which has a 5.1 per cent share, and consumer magazines, which have a 4.6 per cent slice of the market. The internet market is three times the size of radio advertising, which has a 3.4 per cent share. Mr Phillipson said that a key driver for internet advertising was the increase in the broadband market. Broadband take-up in the UK is rapidly increasing, with ten million British households now using high-speed internet access, according to the Office for National Statistics. The take-up of broadband represents 40 per cent of UK homes, an increase from the 8.5 per cent of households only three years ago. “With more than 80 per cent of home internet users now accessing through a high-speed connection, advertisers are able to deliver far more creative and engaging communications,” the IAB said. The research also revealed that advertising on internet search sites, which has led to Google’s success, is still the most popular area of the internet advertising market and growing at the fastest rate. Search advertising in the first six months of the year grew by 58 per cent to £531.3 million from a year earlier, and represents 57.9 per cent of total online advertising. Online display advertising grew by a third to £215.9 million and accounts for nearly a quarter of online spending. Internet classified advertising grew by nearly a quarter to £162.2 million, a share of 17.7 per cent. Interruptive formats, which include pop-up adverts, fell by 9 per cent to £6.8 million. The format now comprises only 0.7 per cent of all online advertising expenditure.